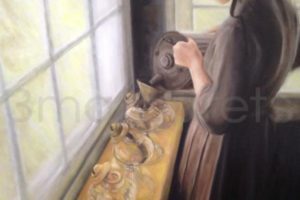 Many of the traditional tools used by the Amish require an investment of time and skill, but also bring rewards in a daily routine filled with moments for reflection. Amish children are included in the work of the household from the beginning of their lives, which requires patience on the part of their parents and older siblings. Patience is a virtue that is often less cultivated or appreciated today. 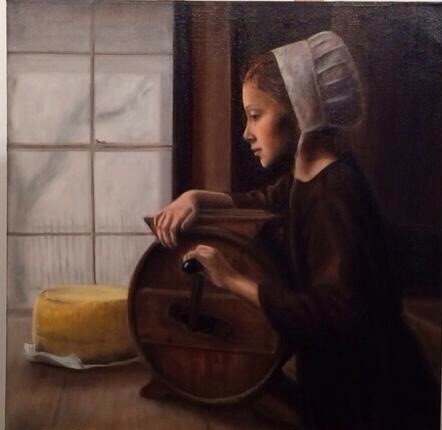 This Amish girl goes about the laborious and time-consuming weekly job of churning butter for her family. But is it a chore? Or does it provide her with a quiet time of reflection for her own thoughts, as well as a sense of self-worth and a valued place in the family economy? There is something about ‘Patience’ that refuses to let one’s eyes wander away. It’s unexpectedly captivating. Is it the simplicity of the life it depicts? Is it the way Margaret has drawn one’s focus to the amish girl’s benign expression? I think Margaret’s use of the light here is what makes an otherwise simple scene into something that will keep drawing one in. Thanks so much, Margaret.